Combination of ultra-light Torayca T800-30T, M40S-40T and T700-24T high modulus carbon fiber monocoque construction. Integrated Seat Post (ISP). No more slipping seatpost! The ISP helps transfer of power to the cranks by minimizing the play and bending deflection at the seat clamp junction that are common on traditional frame design. Non-ISP version available as option. (See photos in gallery for standard seat tube version). BB30 bottom bracket - a new standard that is stiffer, lighter and narrower than traditional bottom bracket systems. A BB30 shell adaptor is also available to allow the use of a traditional bottom bracket assembly. Oversized head tube for extra front-end stiffness. Beefy aero-profile chainstays for efficient power transfer. Stylish wishbone seatstays, optimized for road noise dampening. 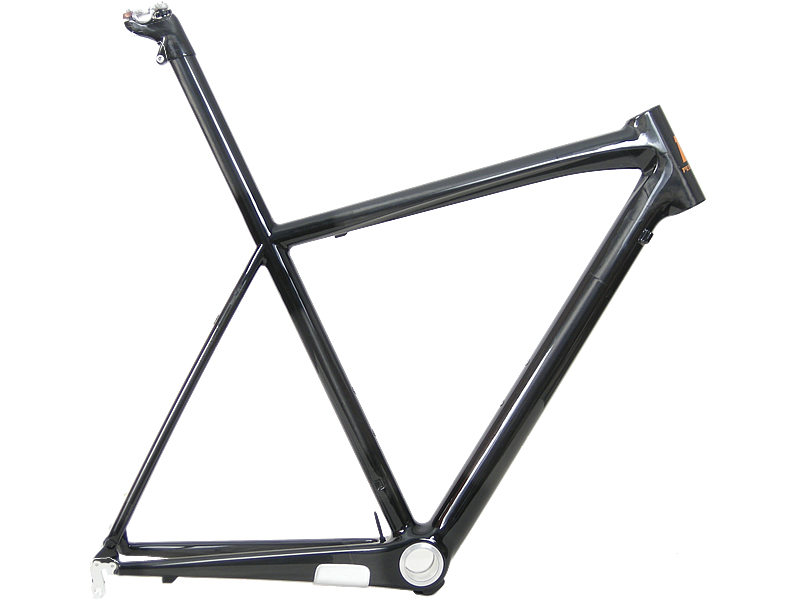 Price is for frame, fork, and headset only. Integrated seat post. Seat clamp included.